"Dakota Moves on Crow Creek"
Youth on the Crow Creek Reservation face a double risk: diabetes and obesity. The Crow Creek Head Start program wants to change this. Last year, Penny Marsh, the Crow Creek Head Start Director in Fort Thompson, South Dakota, and Anne Reddy of Rural America Initiatives teamed up with Lynn Cuny, a diabetes prevention coordinator from the Indian Health Service, and National Relief Charities. Their goal was to create a curriculum for Native American youth that would help change diet and exercise habits early in life and impact long-term health. This project is funded by a General Mills Champion for Healthy Kids grant — and it's working!! Lynn Cuny is an enrolled member of the Crow Creek Sioux Tribe. As a collaborator on the project, she has been instrumental in helping the Head Start and community hook into one very important truth. Once we were really healthy by doing things that were traditional. With this in mind, we've developed a culturally-relevant curriculum called "Dakota Moves" © — it incorporates traditional activities such as pow wow dancing, rain dancing, running like a buffalo herd, and learning to cast for fishing. All of these activities are accessible and familiar on the reservation and supplement the existing "Creative Curriculum for Preschool" used by Head Starts nationwide. Realizing that the youth need support at home too, our Head Start partner has involved adults from the community. Parents from the Head Start Policy Council planned a healthy cooking demonstration and had booths where participants could taste test wild game, sugar-free baked goods, and vegetables. Representatives from the Crow Creek Wellness Center also planned and hosted a healthy cooking demonstration using Walleye fish caught locally in the Missouri River. 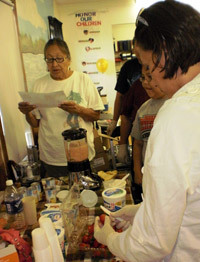 National Relief Charities helped facilitate the cooking demonstrations and developed a list of healthy food items that are in stock at the reservation grocery store, as well as healthy recipes that can feed a family for under $20. NRC also plans to conduct a training session on reading food labels in the near future. With our food budget, I didn’t know there were healthy options, but you showed us there are and that healthy food can taste good. My children want more fresh fruit and vegetables now. Many of our people forget how much wonderful wild game we have here (deer, pheasant, duck, geese, fish from the Missouri River) and hunting and fishing is free. I think Dakota Moves is encouraging people to hunt and fish like our grandfathers and great grandfathers did. You made me realize how much junk we have been putting into our bodies and how much we have lost our traditions of living off the land. It is so easy to put something in the microwave or go to McDonalds, but this program has challenged me to stop and think about what I am feeding my family. This training should be offered to all Head Start Programs! It was the most culturally significant training I have had! I will try some of the exercises and games with my grandchildren at home! You got me motivated to lose weight and get healthy to live longer! Dakota Moves is gaining traction on the Crow Creek Reservation, and the parents are excited about taking it to another level with healthy gardens. People are already signing up for garden tilling and seeds, as well as training on garden care. We are working with the SDSU Extension, a program of SD State University's agricultural college, to provide technical support to the Crow Creek families who plant gardens. Future possibilities with SDSU include a 4-H program that would include the early head start children, access to more fresh produce, and culturally-relevant nutritional materials for the Head Start. 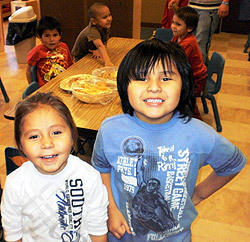 Here at National Relief Charities we agree with the Crow Creek Head Start team that the Dakota Moves curriculum is a model that can be used by many Native American communities to improve exercise and nutritional choices and impact long-term health for youth and families. For more information about National Relief Charities, please visit: www.nativepartnership.org.